Arrangements have been made to observe the Feast of Tabernacles at Grande Shores Ocean Resort in North Myrtle Beach, SC. Please make your reservations A.S.A.P. and let us know you are coming. Rooms start at $45/night!! They are located at 201 77th Avenue North Myrtle Beach, SC 29572. This site is an answer to prayer. We look forward to seeing each and every one of you, please make your reservation today! Remember to bring your musical instruments for song services, special music and the fun show. For a reservation please call 877-798–4074 option 2 and tell them you are with the 7th Day Church of God and use Group Reservation Number: 2415379 for a group rate. You can use a credit card to pay the two night deposit or send a check or money order within 10 days. The remaining balance is due at Check In. They accept: American Express, MasterCard, Visa, and Discover. PLEASE MAKE ALL RESERVATIONS BY SEPTEMBER 24, 2018 TO RECIEVE THE GROUP RATE. There is a variety of different rooms from a 2 room motel to a 3 bedroom condo. For additional info call 877-798–4074 option 2 and tell them you are with the 7th Day Church of God and use Group Reservation Number: 2415379 for a group rate. Grande Shores' multi-level oceanfront pool area is the perfect spot to soak up the South Carolina sunshine. Float around the lazy river or relax in one of our 4 hot tubs. Need a break from the sun? Our expansive indoor pool area will delight the entire family with a kiddy pool, hot tub, and heated swimming pool. 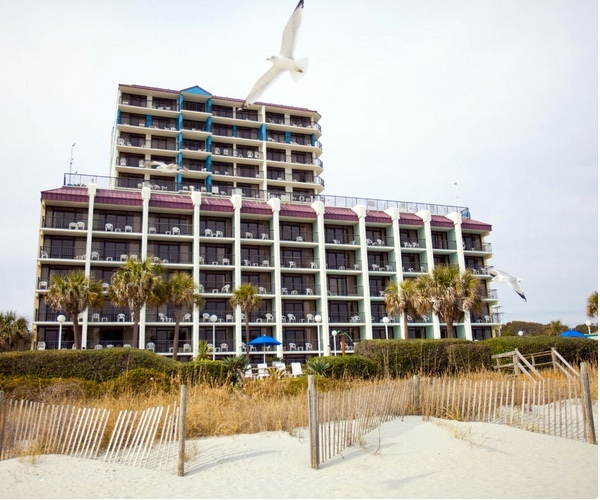 Outdoor water amenities include an oceanfront pool deck with 1 pool and 1 lazy river and an elevated oceanview pool deck on the 7th floor with 1 pool, 4 hot tubs, and 1 lazy river. Indoor water amenities include 1 pool, a kiddy pool, and a hot tub. Indoor water amenities are heated year-round. There is a onsite Cafe, one of the best things about vacation is enjoying delicious, well-prepared cuisine at every meal, and no one understands this better than the Shoreline Cooks. For breakfast and dinner, guests are invited to savor a variety of American specialties, highlighted by comfort food favorites. In the morning, Shoreline's delicious breakfast options will start your day right every time. Grande Shores features a fitness facility with cardio and weight equipment. When you stay at Grande Shores, you’ll receive Perfect Stay Perks to make your stay even more memorable. We can look forward to having a great time this year. Please consider joining us in worshiping God this year. I hope to see all of you at the Feast!